various peeps have been telling me about naked pizza for some time now ... well, since one opened over on diversey last spring/summer. naked pizza's mantra is all about "delicious, honest pizza with no freaky chemicals, based on the latest nutritional science." sounds right up the vegan alley, right? i had heard two different opinions about naked pizza before trying it. the non-vegan side : delish! the vegan side : good, but a little heavy handed on the daiya. 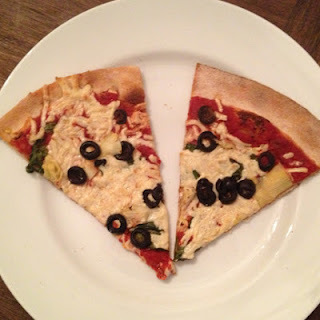 daiya mozzarella cheese, black olives, spinach & artichokes. i'm not sure the last time i had a legit pizza with actual vegan cheese. so naked pizza really hit the mark there. the only issue i had was too.much.daiya. oh, and not enough veggies! i love lots o' veg on my pizza (i am vegan, after all). my vegan friend was right. but i think this issue is really a vegan/non-vegan one. i used to be a regular old eater. and i can honestly tell you ... you can't ever have too much cheese on a pizza. but for vegans, you can have too much vegan "cheese." so to pile on the daiya ... slightly too much. don't get me wrong ... i did enjoy naked pizza .... and i will certainly try it again. in fact, i'm looking forward to it! next time : light daiya, extra veg. mmm. Hi Halley, we are so glad you enjoyed your vegan Naked Pizza. Thank you for the great blog post! We’d like to create a coupon for your next Naked Pizza and for your followers to give Naked Pizza a try Please let me know if you are interested! email me at halley@thechicityvegan.com with details!